What can you do to keep your attic cooler? These are all solutions to help keep your attic moderately cooler. BUT if you are looking for a better solution that will save you a substantial amount of money on your energy bill, install a radiant barrier. 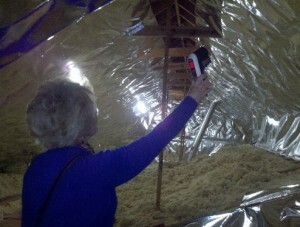 Radiant barrier will reflect heat out of your attic, rather than absorb it. Many homes with radiant barrier see their attic consistently under 100 when it is over 100 outside. There is also a noticeable difference in the usage of the HVAC unit. Many customers notice an immediate difference in how often their AC unit is running in the summer. To find out more about the radiant barrier, give us a call for a FREE home energy audit and we can show you in 35 minutes how you can save up to 35% on your energy bill!